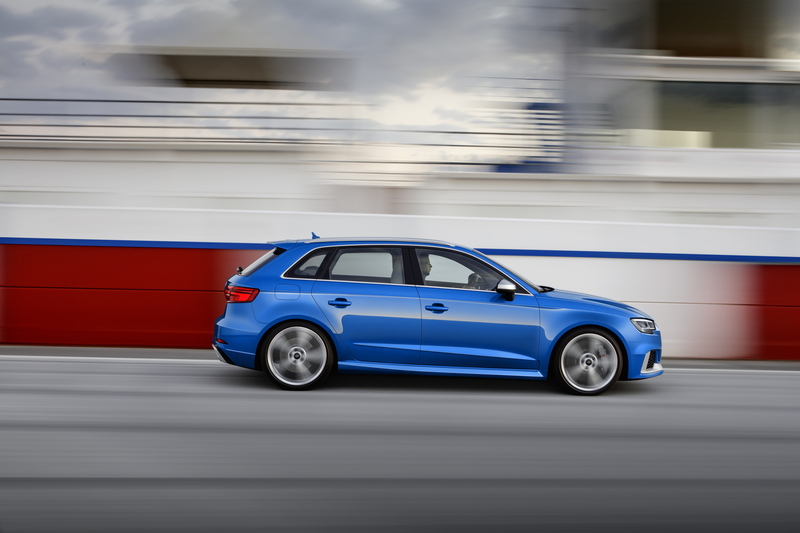 A decade ago, a hot hatch with over 200hp was quite something so it’s still quite hard to get our heads around the fact that the new Audi RS3 Sportback – the hatchback sibling to last year’s RS3 saloon – now develops a heady 400hp. Yes, you read that right. 400hp. That’s the same output as a Ferrari 360 Modena. Thanks to an arms race headed by VW, Mercedes-AMG and Ford, modern hot hatches are now as potent as entry level supercars from the turn of the millennium. Crazy stuff. 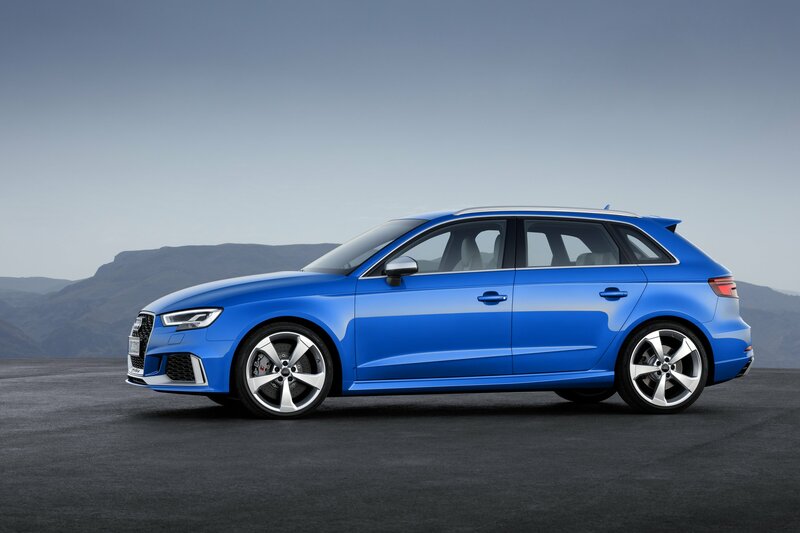 Developing 33hp more than its predecessor, the new 2017 RS3 Sportback’s 2.5-litre five-pot motor means that Audi now holds the mantle for the most powerful hot hatch currently on sale, eclipsing the equally mental Merc A45 AMG. 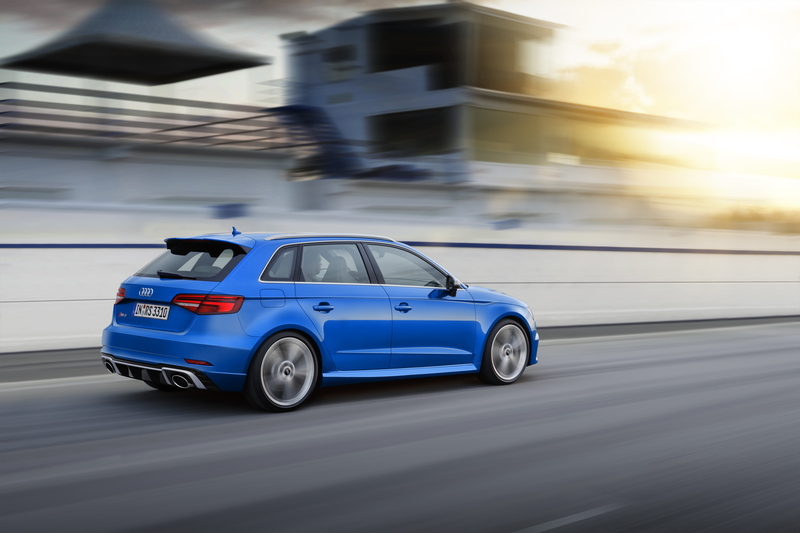 Despite its improved output the Audi RS3’s engine is now lighter too and, combined with Ingolstadt’s iconic quattro drivetrain, helps the hatchback to sprint from 0-62mph in 4.1 seconds, enough to see off the latest Porsche 911 Carrera in a traffic light drag race. 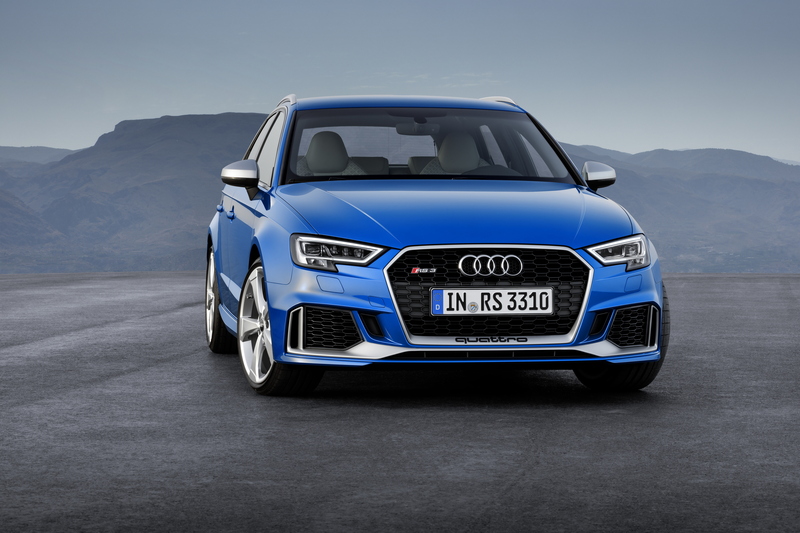 As part of the German’s gentlemanly agreement, the new RS3’s top speed is limited to 155mph, though ticking ‘dynamic package plus’ on the spec sheet sees figure derestricted to 174mph, more than enough to destroy most rivals on the autobahn commute. Housed inside the 19-inch alloys, it’s the job of the 310mm front and rear brake discs to slow the Audi RS3 Sportback down and, for even better braking performance, carbon ceramic stoppers are now offered as an option. Like the previous generation RS3, the 2017 update looks suitably menacing, a wider front track, flared arches and Audi’s signature ‘Singleframe’ grill combining with the 25mm drop in ride height and large RS boot spoiler to provide a purposeful aesthetic that will, no doubt, soon be hounding your rear-view mirror. Inside, the new Audi RS3’s standard dialled dashboard can be replaced by the latest virtual cockpit. Selecting this option brings with it a special RS screen layout that sees that rev counter switched to the centre of the dash, flanked on either side by special ‘gauges’ for torque, g-force and tyre pressure. What’s more, when you’ve got the ‘S tronic’ seven-speed ‘box set in manual mode, the digital dash helps you perfect your upshift timing with a new shift light system that changes colour as the revs reach peak rpm. 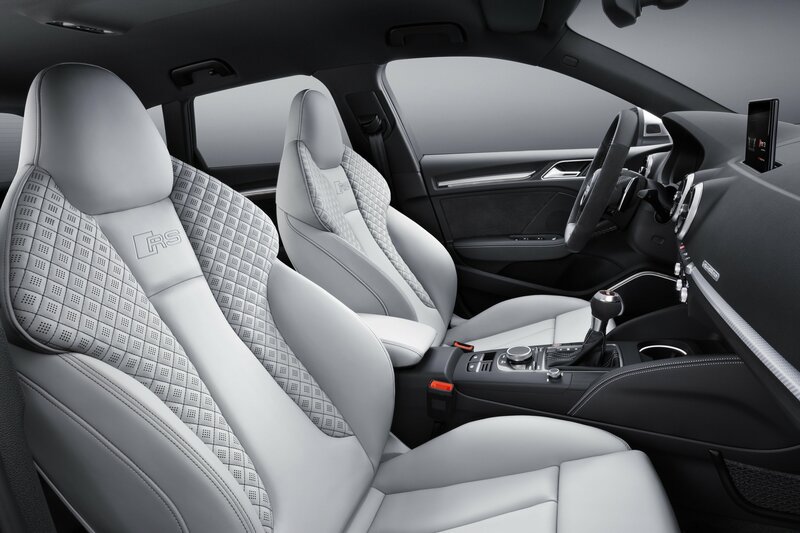 As you would expect, there are myriad drive mode options controlling all aspects from the steering and throttle response to the stiffness of the optional RS sport suspension, while the quattro drivetrain does its usual job of distributing power to the front and rear axles depending on your speed and cornering force. 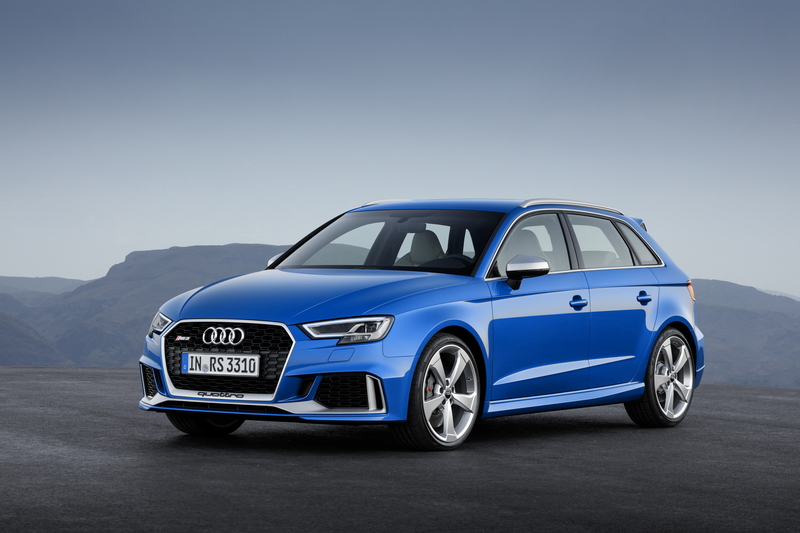 In the UK, order books for the new Audi RS3 Sportback and Saloon will open in the summer, with pricing expected to be confirmed closer to the time. At the moment, deliveries are simply scheduled for ‘later in 2017’ but, if you need the hottest hatch of them all, we’ll keep you updated here at Flat-Out.